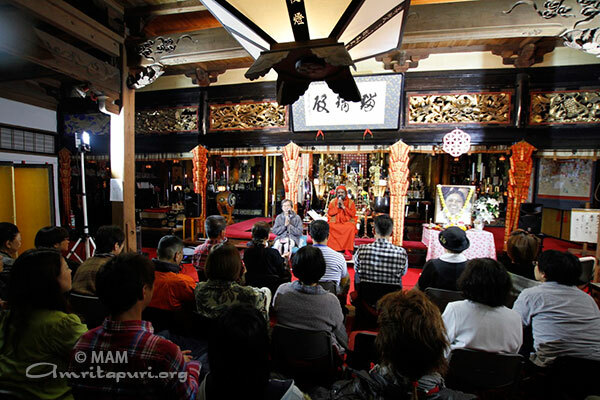 The public program in Ishikawa Prefecture was held in the Koya-san Shingon-shu Daiohji Temple. 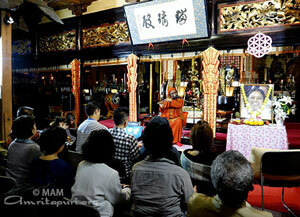 The temple was originally built 1300 years ago, and was restored in 1745 after a damaging fire. 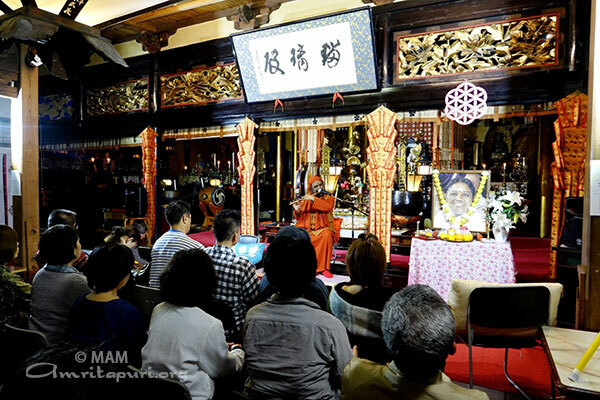 The program started with a Buddhist Sutra chanted by the female head monk. 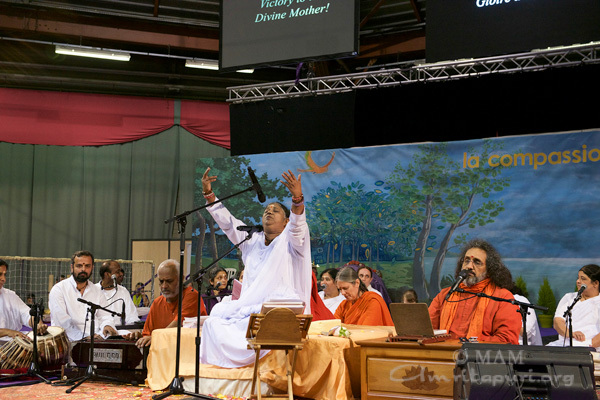 Swami Poornamritananda gave a spiritual talk about Buddha and Amma. 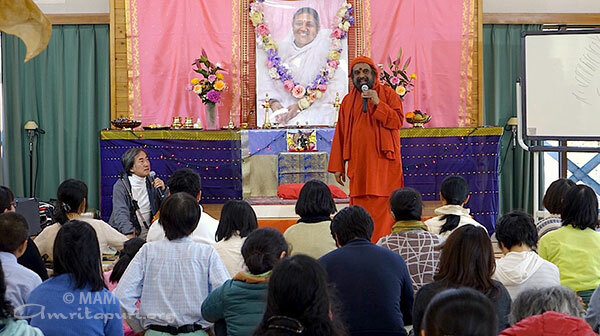 At the end, participants asked passionate questions which were warmly answered by Swamiji. 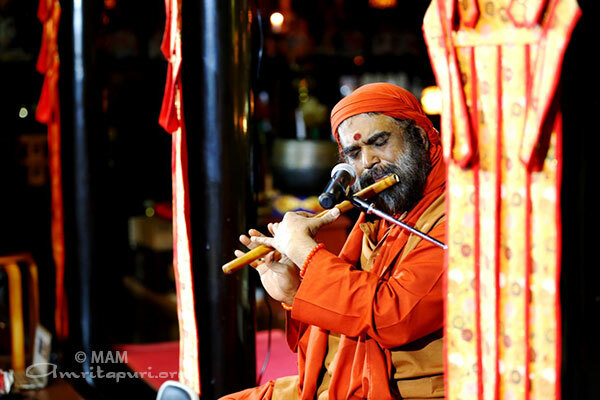 Attendees also participated in a meditation accompanied by Swamiji’s peaceful flute playing. 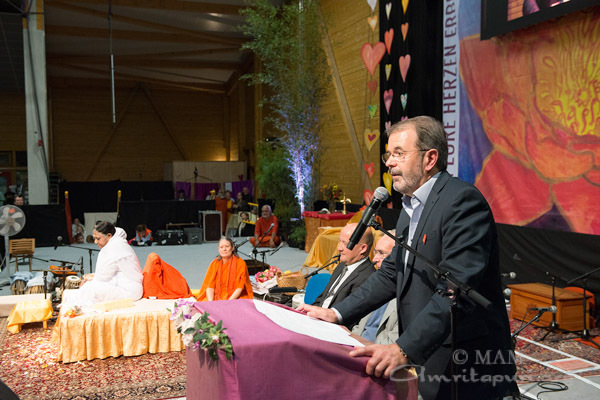 The traditional Indian festival of Navaratri was celebrated with a one-day retreat led by Swami Poornamritananda. 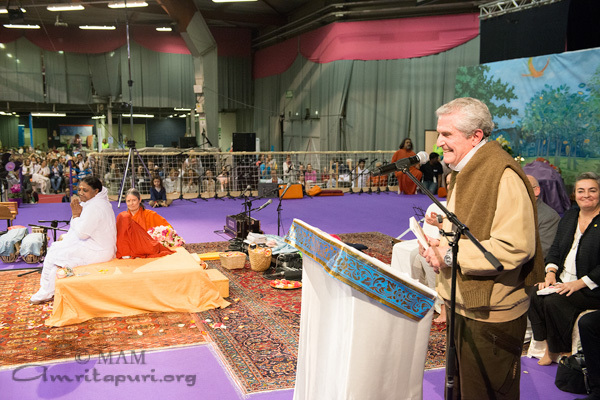 Just before the ceremony, participants offered various tools, equipment, and utensils in front of goddess Saraswati as part of Ayudha puja. 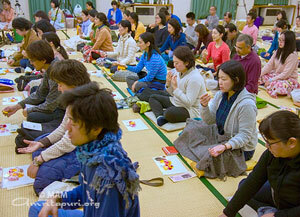 In the morning, everyone participated in a Saraswati puja guided by Swamiji. 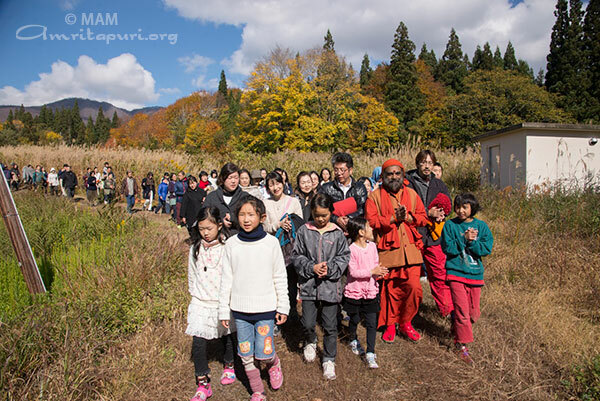 After the puja, adults and children alike celebrated Vijayadashami. 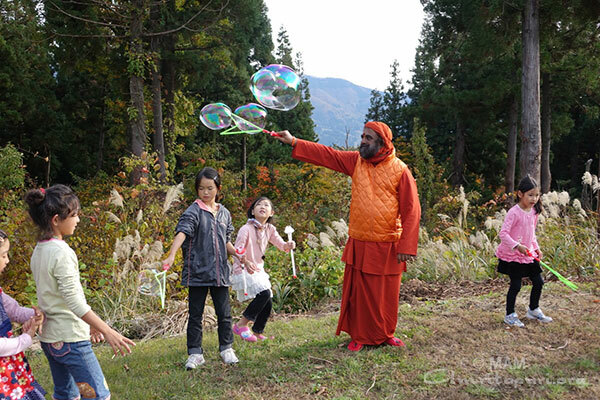 Everybody became like small children while learning how to write ‘Hari Sri’ in Sanskrit letters. 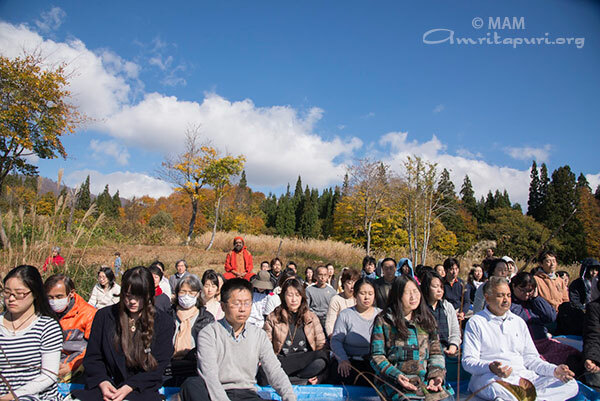 The focus and concentration was palpable as it seemed everyone forgot everything else. 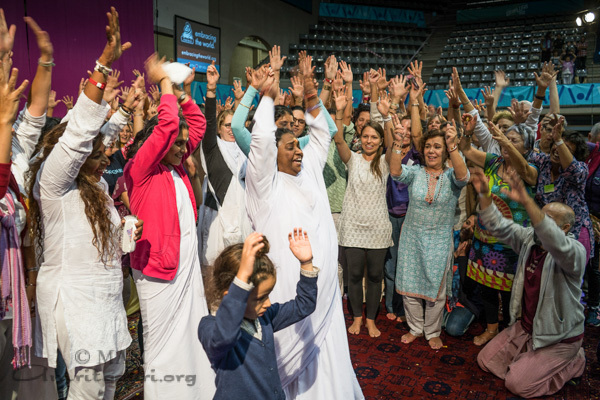 The hall was filled with pure energy and happy faces were everywhere. 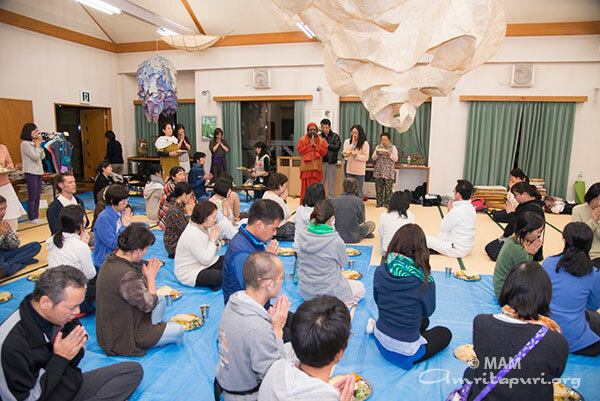 In the afternoon, there were culture programs including Indian dancing and singing. 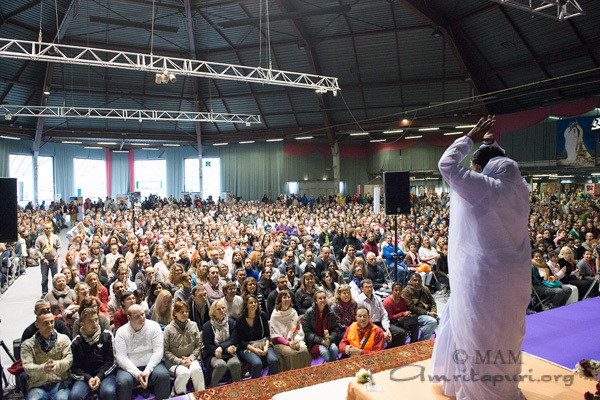 The fourth stop on Amma’s 2015 European Yatra was in Cergy-Pontoise (near Paris, France). Every year on this tour some of the biggest crowds turn out in this city and this year was no different. 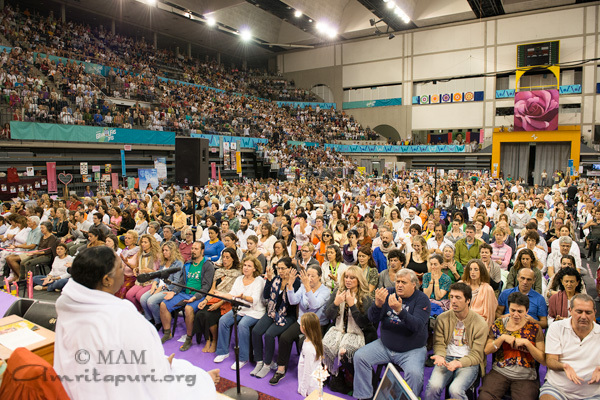 Massive crowds came every day and filled the large hall awaiting their chance to spend a few moments in Amma’s arms. 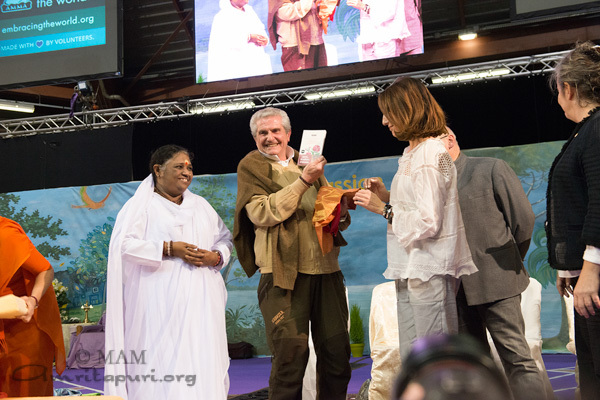 Amongst those who came to meet Amma were Academy Award-winning film director Claude Lelouch and renowned actress Elsa Zylberstein. 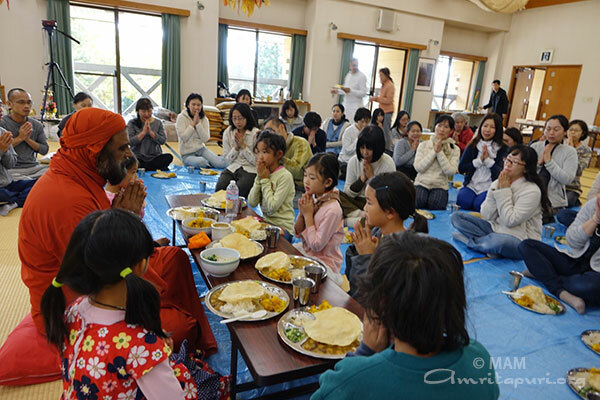 Mr. Lelouch’s upcoming film “Un Plus Une” co-stars acclaimed actor Jean Dujardin and Ms. Zylberstein and features Amma as herself, when the lead characters’journey culminates in a meeting with Amma. 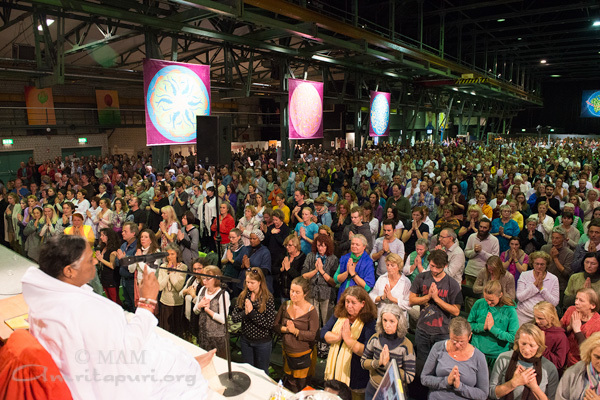 All three days Amma gave darshan all day and all night into the early hours of following morning. 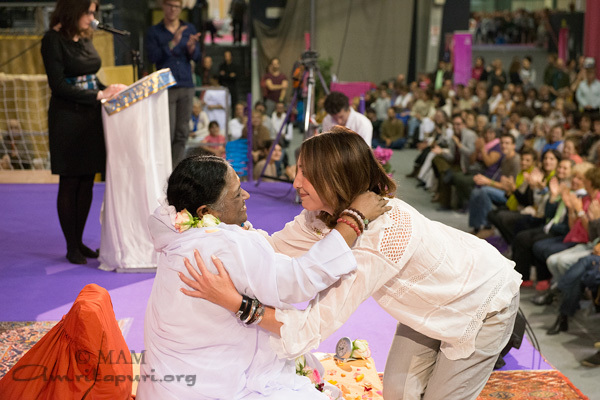 The final program ended at 10am the day after it began, with Amma sitting until she had embraced each and every last person that came for the program. Students of Amrita University are using this year’s Navaratri festival to launch an initiative designed to make respect for women‬ and girls‬ both cool and a matter of personal pride. 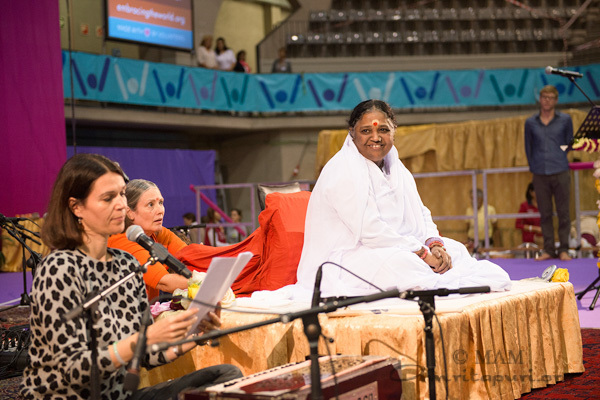 Named as Vijaya Raksha, started with the blessings of Amma, the campaign aims to bring a social change through a religious festival. 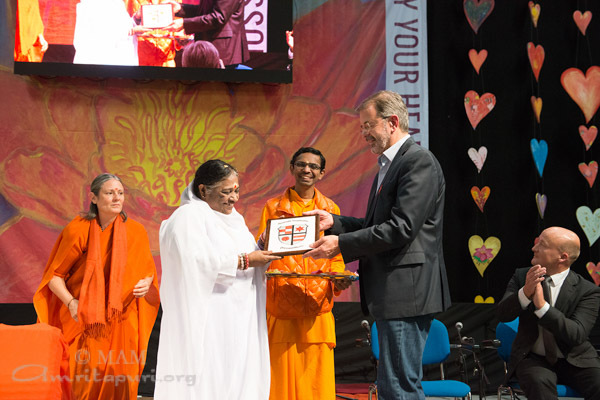 It is initiated by the Vedanta Club of Amrita University, Bangalore, India, to bring awareness throughout the country using Navaratri as a platform. 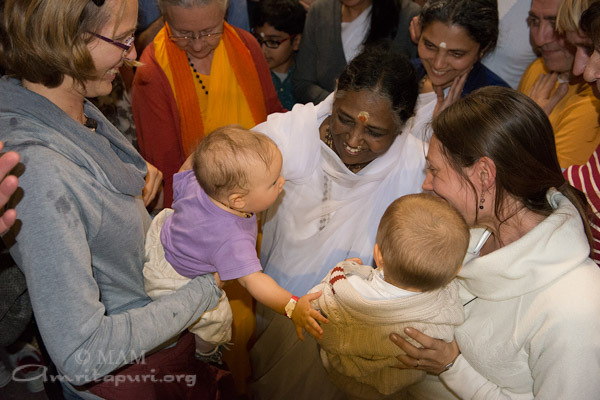 Vijaya Raksha is also about educating the next generation and creating awareness in each one of us about the divinity of Motherhood. 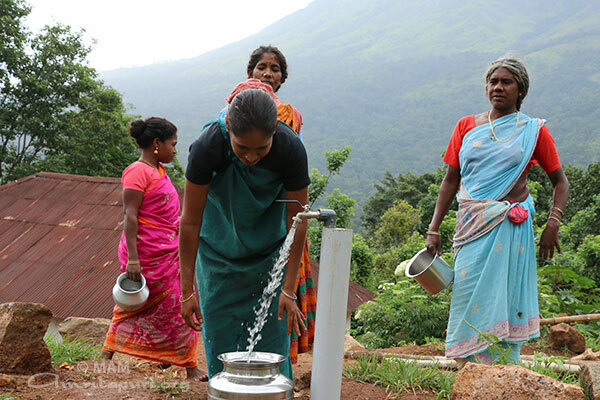 The mythology and culture of this land is so intrinsically woven around women that every element of it reflects the divinity and power in her. But, just as a tiger’s beauty is its own enemy, a woman’s treasured characteristics like love, compassion and piety are mistaken as her weaknesses. 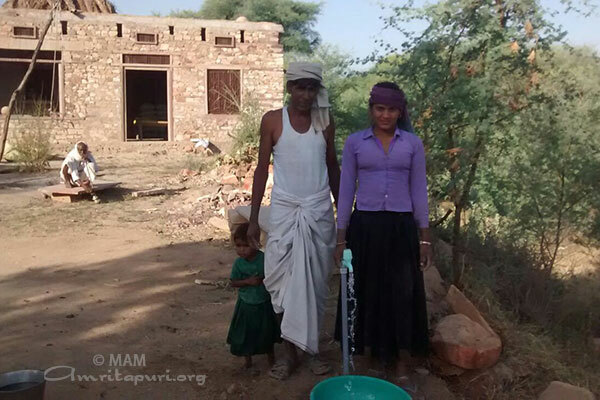 She is mistaken for the weaker section of the society. 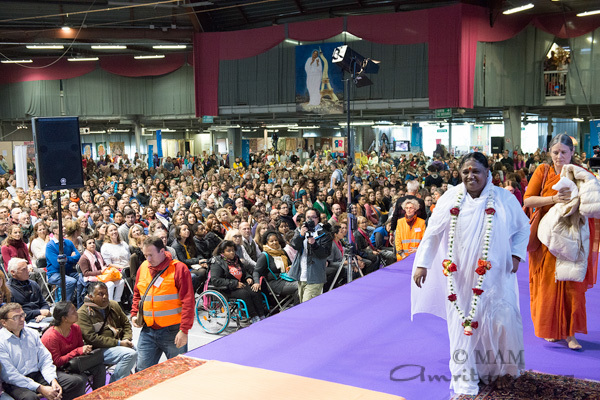 The result is what we see today— abuse and oppression of women. We have to change this. 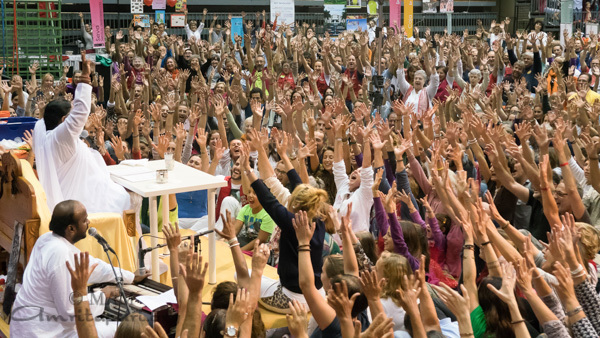 We are by her; we are for her. 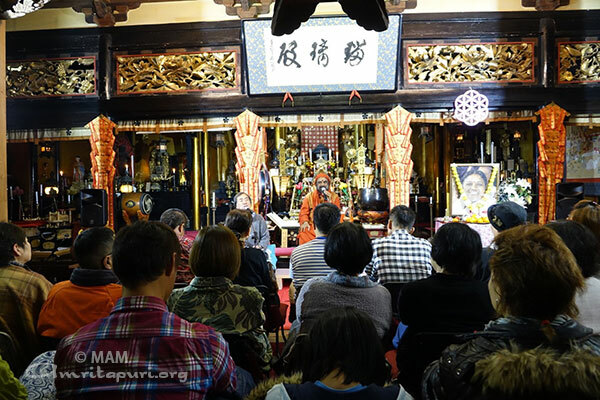 As the campaign’s founders declared, “People worship the Goddess in the temple for 9 days, but the same people abuse the walking goddesses on the street. We have to change this. 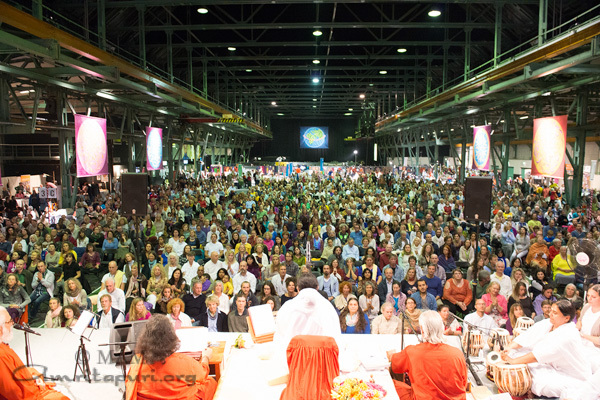 This is possible only if we start seeing the goddess in every woman”. They call this the “Respect Women Challenge” and have called on both students and other males nationwide to take the challenge and invite their friends and family to do the same. 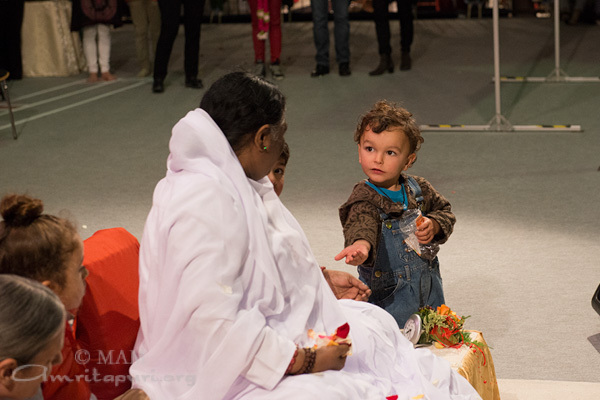 You may recollect that during Amma’s sadhana leela, she used to run towards little girls and hug them seeing them as Divine Mother. 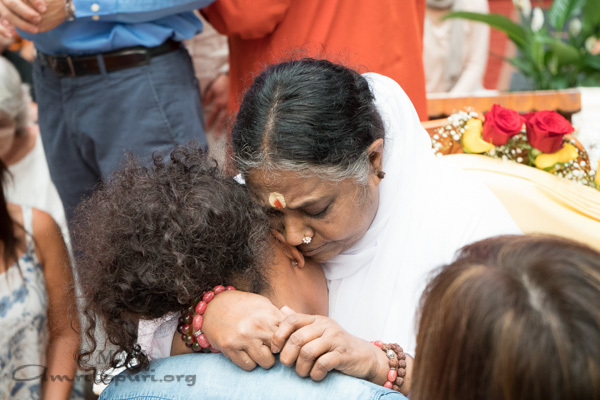 In her deep anguish of separation from the Divine Mother she would sometimes cry and scream aloud. 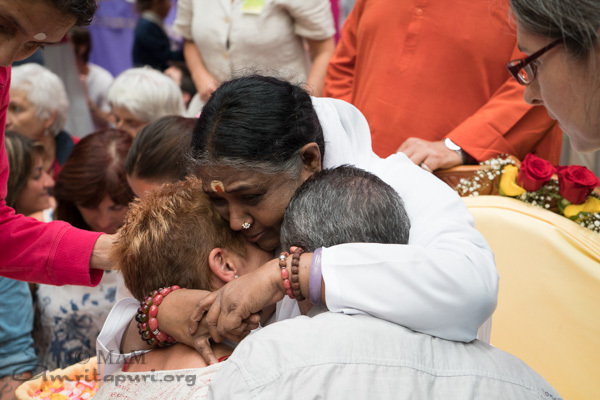 Eventually they, too, came to understand that she was crying to see Devi. 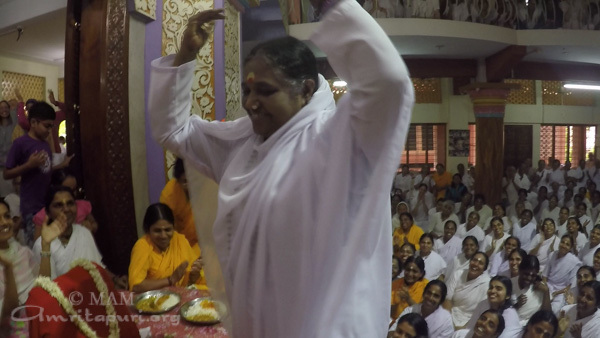 During these uncontrollable outbursts, one of her younger sisters would stand before her, assuming the pose of Devi, wearing a sari and cascading hair. In great joy, she would run to embrace her. If she should notice any girl when she was in this mood, she would run to her enthralled. 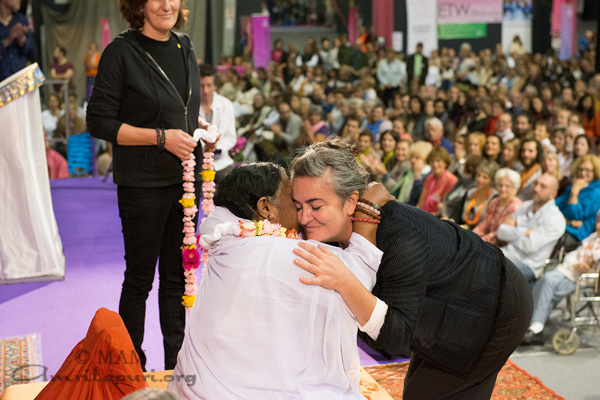 Embracing and kissing her, she saw only Devi in all. 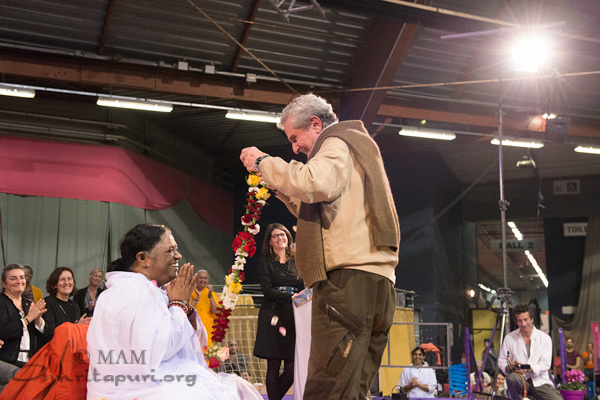 A man/boy who pledges to take up the vow of Vijaya Raksha should approach a woman/girl whom they are not familiar with and tie a raksha (a red thread) around her wrist. Do this with an attitude of respect. 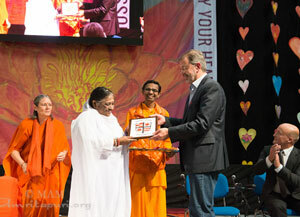 Then touch her feet and thank her for her contribution to society and her role in protecting humanity. Motherhood is the greatest blessing God has given her. He should acknowledge seeing God in her and should seek her blessings. Respect her Motherhood. He should also make her aware of the reason behind this movement. 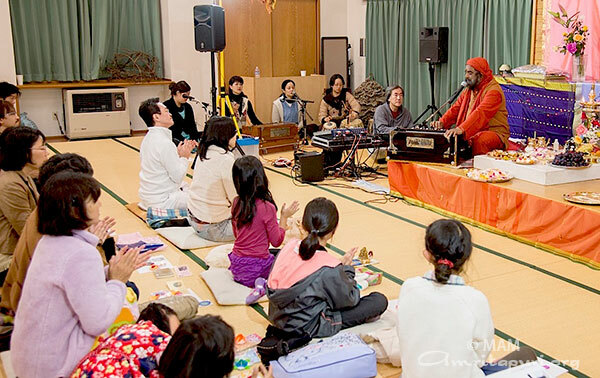 Do it on all 9 days of Navaratri. 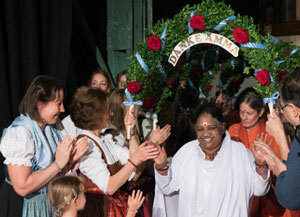 The second stop on Amma’s European Yatra was Munich, Germany. 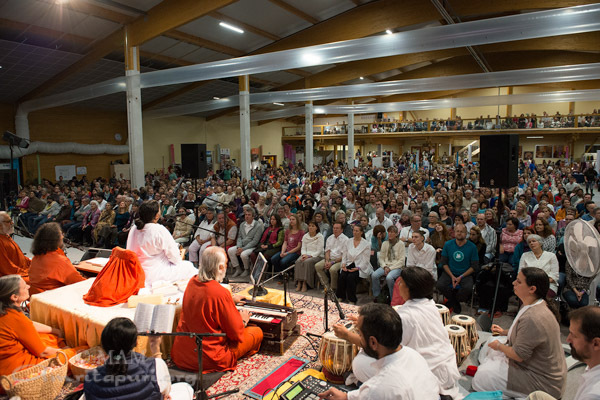 Immediately after the end of the final program in Barcelona, Amma and the group travelled more than 1300km across Europe from the Iberian peninsula to the heart of Bavaria. 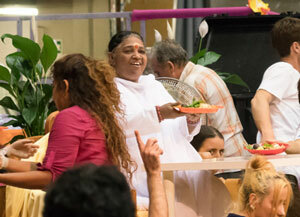 Even though Amma arrived and the group arrived late at night, a few hours later everything was being set up for the next program that morning. 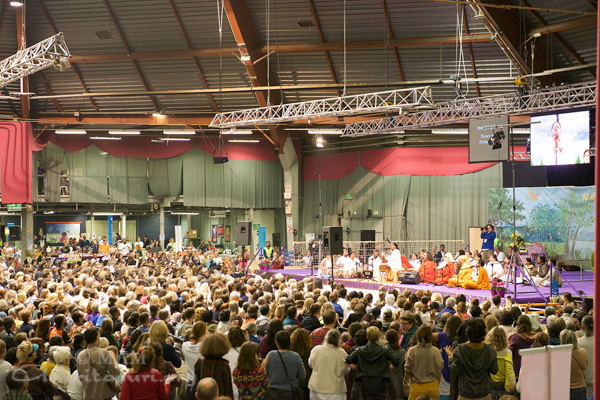 For the last several years Amma’s Munich programs have taken place in the Kulturhalle Zenith. 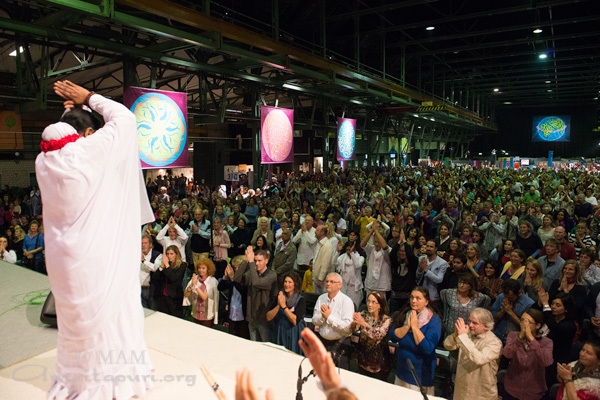 Each day large crowds are delighted to watch Amma descend to the stage to start the day’s program along a high balcony that runs the length of the hall and early in the morning the following day, watch Amma ascend out of the hall along the same balcony. 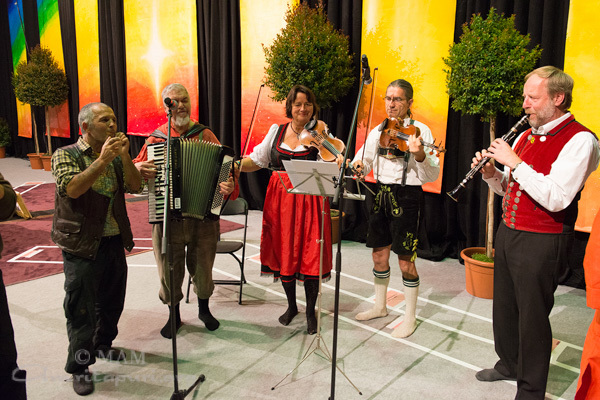 Each day Amma would arrive to the sounds of traditional Bavarian music played by local devotees dressed in ‘lederhosen’ and leave dancing to the beat of the Baduga music that has become the anthem for this tour. 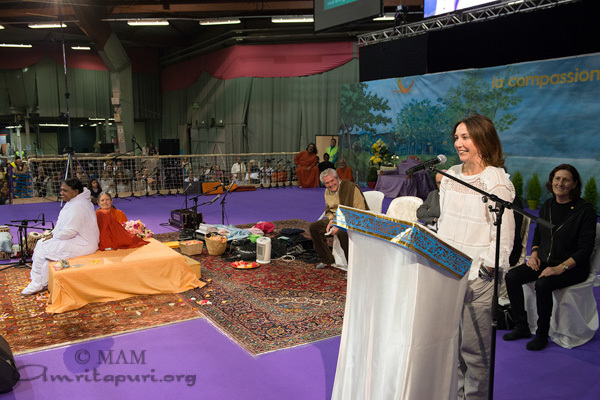 On the second evening Amma was welcomed to Munich by Franziska Buch, well known, award winning German film director and screenwriter. Her work focus is on family and children and she is best known for her very successful children’s movies. Like “Emil und die Detektive” or “Bibi Bloxberg”. 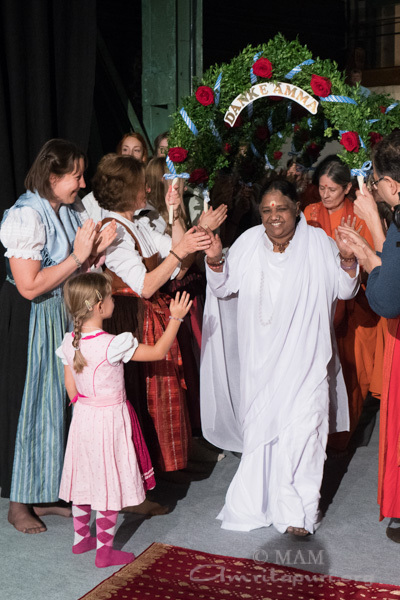 The final evening program finished at 8:14am the following day whereby Amma and the tour group continued to the next stop of the tour in Switzerland. 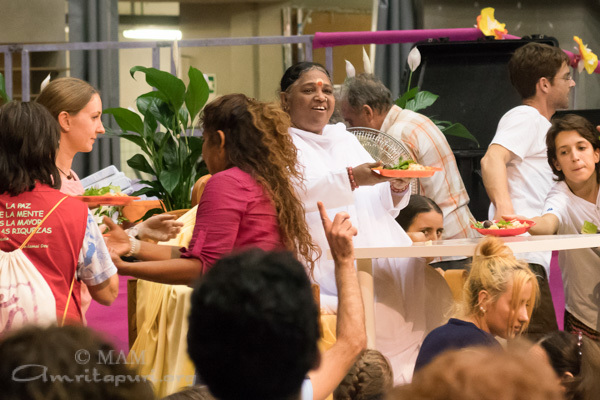 Inspired by Amma’s example, our volunteers working out of Barcelona, Spain have been running an outreach program with the nearby Quatre Camins prison for the past three years. 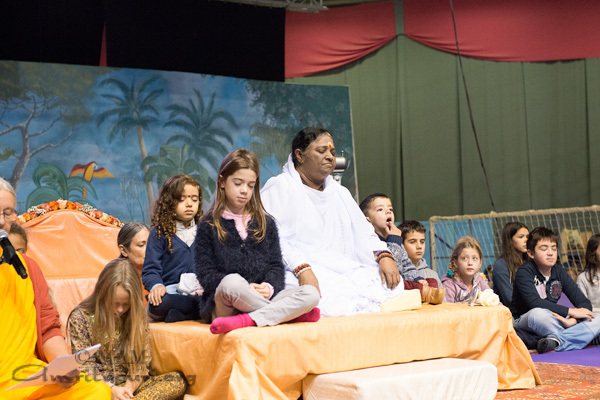 The outreach is led by social worker Amparo Saavedra, who says that she wanted to find ways to incorporate everything she has learned from Amma about peace and love for the last 15 years into her work at Quatre Camins. 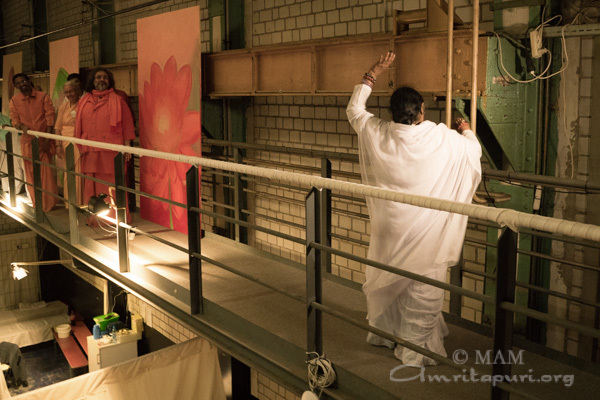 Three years ago, Amparo asked Amma to bring meditation to the prison. 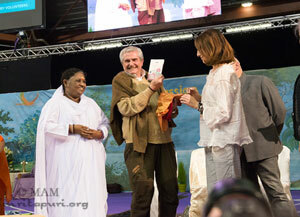 Amma sent volunteer meditation instructors Cristina Rodriguez and Marta Griso, who have been visiting the prison and conducting classes and Amma’s IAM Meditation technique regularly ever since. 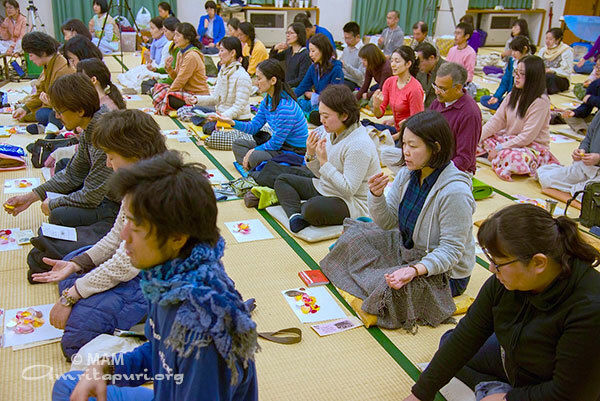 The feedback from the prisoners is that the meditation is making a big impact on their lives—they credit the practice with helping to clear their minds and soothe their hearts. 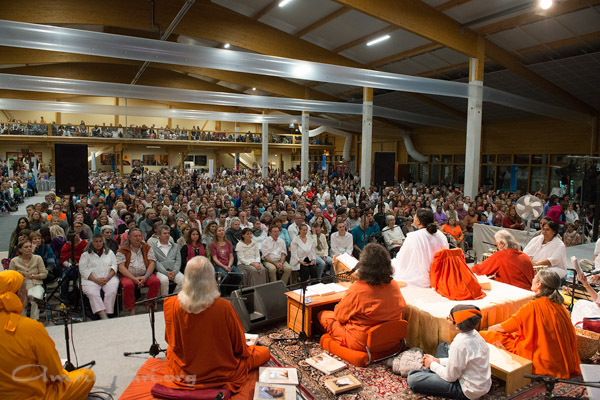 But meditation is not for everyone. That’s why 18 months ago, our volunteers started a garden at the prison called “Amma’s Garden” where the more action-oriented prisoners can learn to grow their own vegetables and enjoy being in nature. 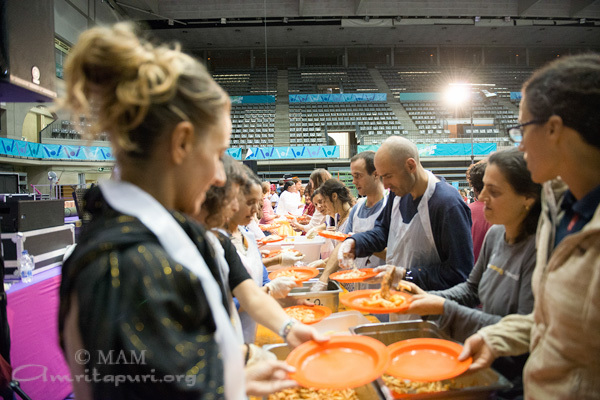 A number of the prisoners also spend two Sundays a month engaged in service activities at the Amma Center of Spain. Finally, the prisoners are fundraising to help children with cancer. They raise money by making and selling bracelets and also by collecting bottle caps, which are sold to the recycling center. The prisoners have placed collection points in key locations throughout the prison, and over time have gotten all the prisoners in the habit of saving their bottle caps and dropping them in the collection points. The friends and families of the prisoners, and even the prison social workers and some of the other prison staff also bring their bottle caps from home and drop them in the collection points. 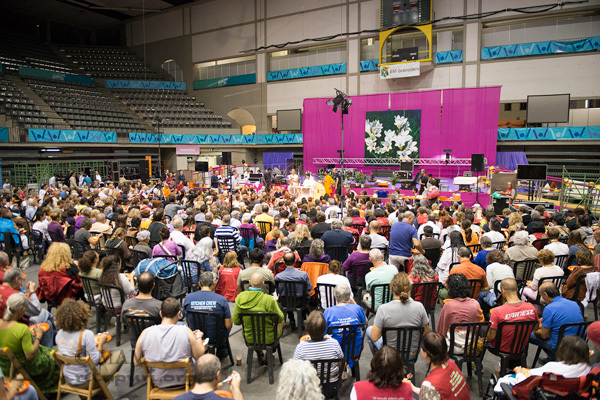 One beautiful thing that has come out of this practice is that many different groups of prisoners within the prison are committed to collecting the caps. 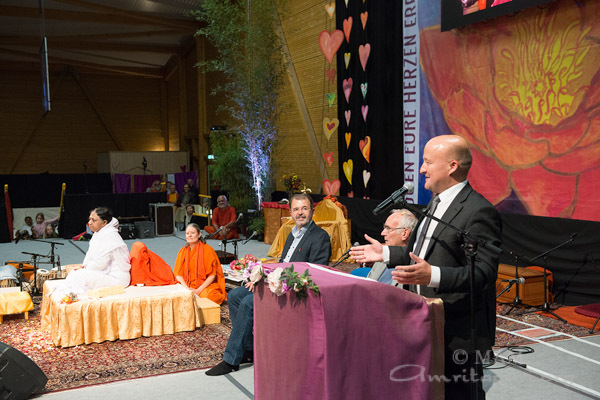 This has created a bridge between groups that would otherwise not have any common ground. 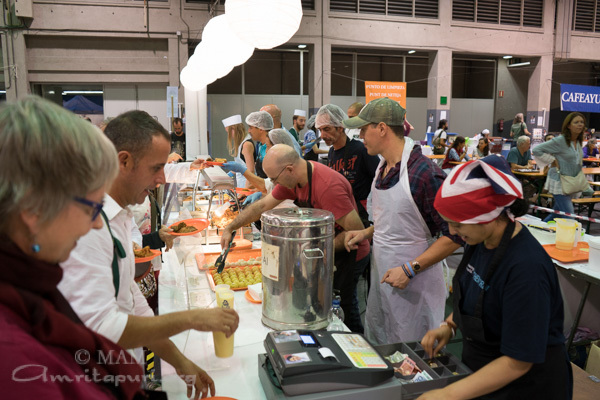 The cap collection program was designed to engage the majority of the prison population, to create an easy positive practice for those who might not be receptive to more structured or involved service activities. 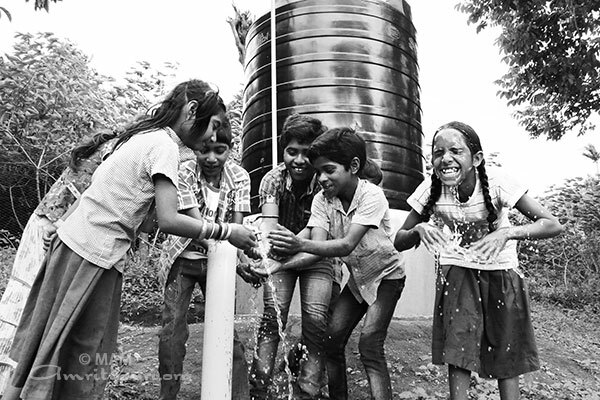 When they hear that they can help children with cancer just by changing the place they put their used bottle caps, they easily agree. One of our volunteers explained that these things are like a small point of light for the prisoners, a simple and achievable act of compassion that opens their hearts and bring positive change into other parts of their lives as well. Help children with cancer just by changing the place they put their used bottle caps, they easily agree. 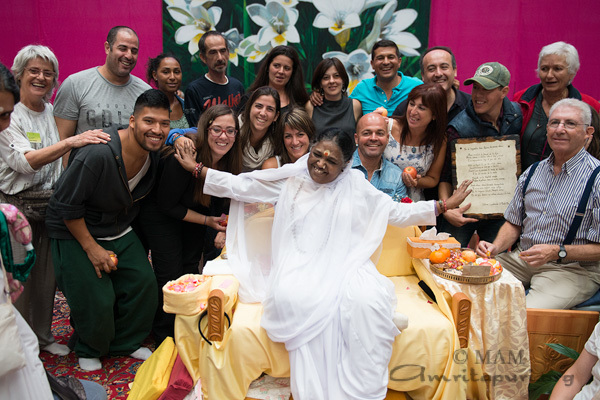 During Amma’s most recent visit to Granollers, Spain, ten prisoners who have been participating in Embracing the World’s programs at the Quatre Camins prison received permission to spend the day at Amma’s program, doing service in support of the program and getting the opportunity to meet Amma personally. 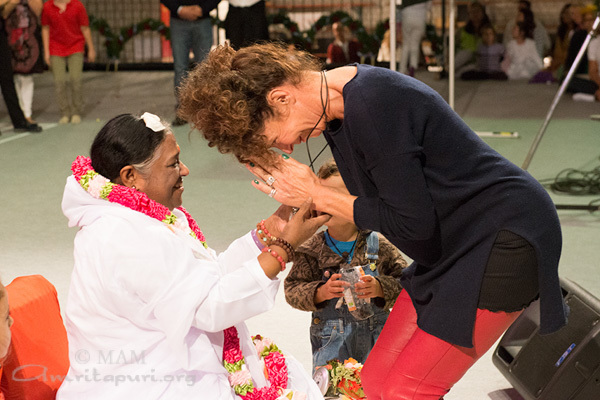 Upon receiving Amma’s embrace, one prisoner commented on how Amma received everyone, regardless of how they look. 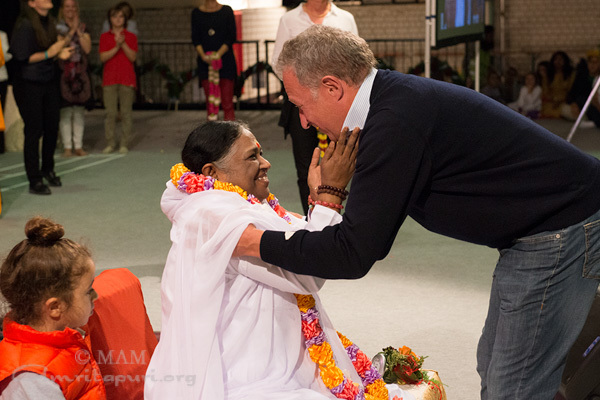 He felt that Amma only saw the goodness of his heart, describing Amma’s embrace as a priceless experience that opened his heart. 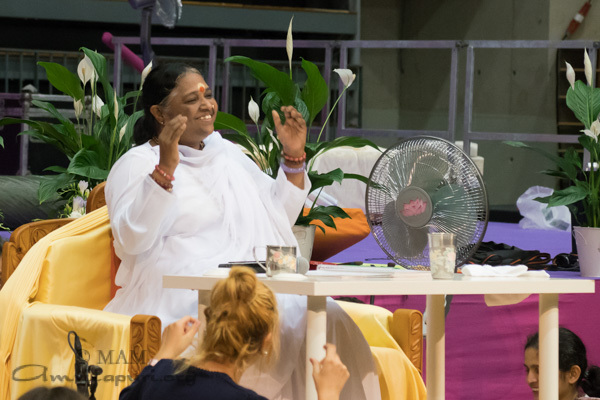 Another commented that there are no words to describe Amma, stating that you have to experience her presence to understand it. 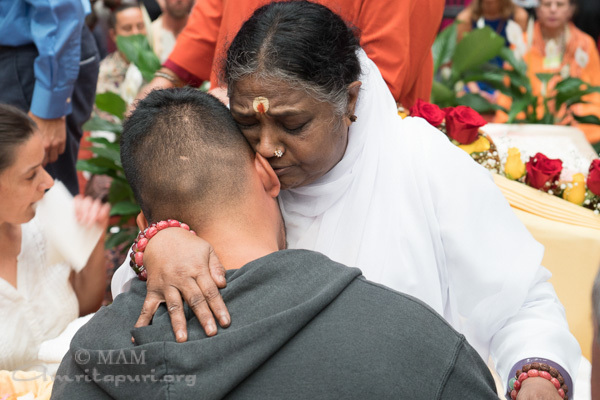 Another stated that Amma can change the hate and war in the world through her infinite love, and that the greatest lesson he has learned from Amma is that you should hug more, and express your feelings more. Moving forward, our volunteers plan to create a program to help newly released prisoners integrate back into society with support. For many, leaving prison can be a very difficult experience. Without the amenities and support of the prison, it can be very difficult to integrate back into society. 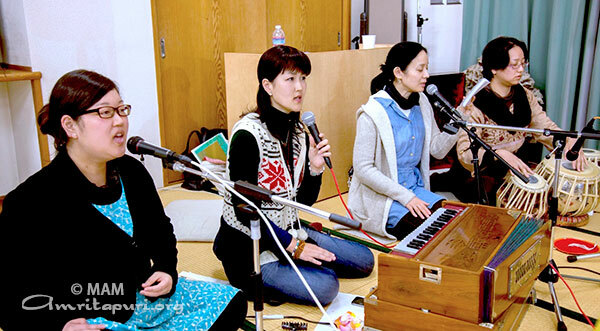 The volunteers are working to expand the meditation courses for newly released prisoners as well. we also are prisoners imprisoned within our own minds. we have been happily distracted. 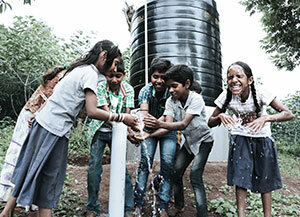 At your side we feel fulfilled. 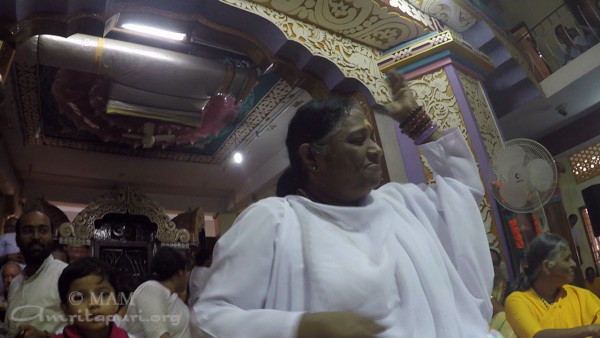 The day Amma would leave for the Europe tour, she came to the Kali Temple around 11 am and the for the next 3 hours, meditated, answered questions, gave advice, cracked jokes, gave a couple thousand people Prasad lunch, gave a quick darshan and finished off by singing and dancing her new signature Baduga dance. 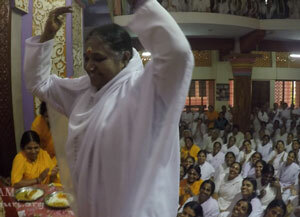 Infact Amma was dancing in many times when she is serving lunch prasad to the residents. 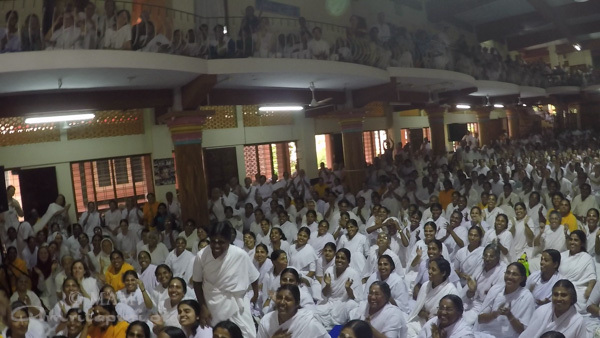 Sad faces thinking of Amma’s impending departure turned to smiling ones reflecting the sheer joy of the moment. 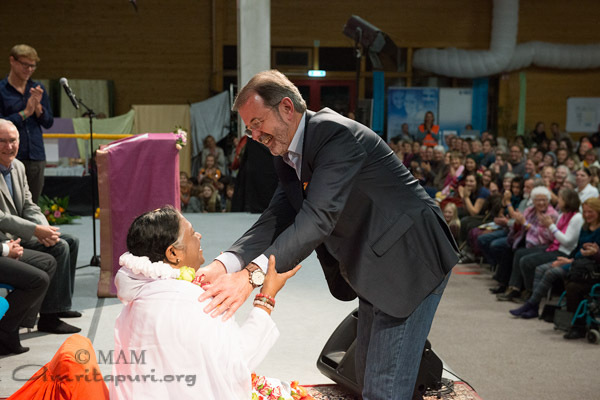 After few hours Amma left Amritapuri for Europe Yatra 2015. 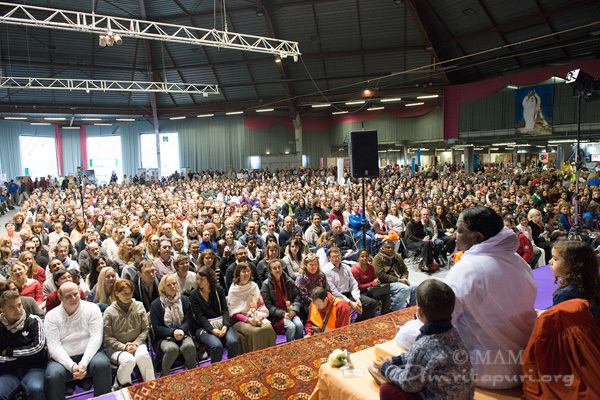 On all the three days huge crowds lined up around the block for their chance to meet Amma. 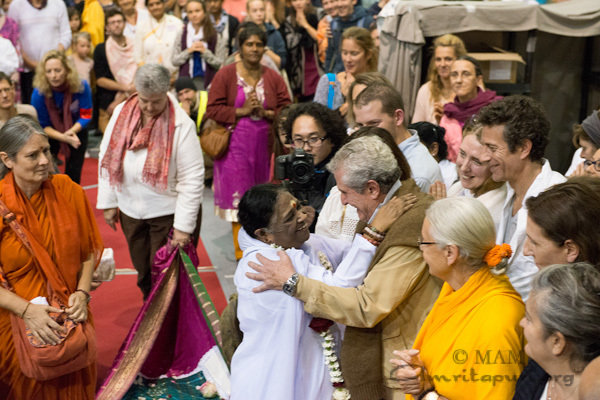 Many were coming to meet Amma for the first time but others, like the Mayor, the Honorable Josep Mayoral, have been coming yearly to welcome Amma. 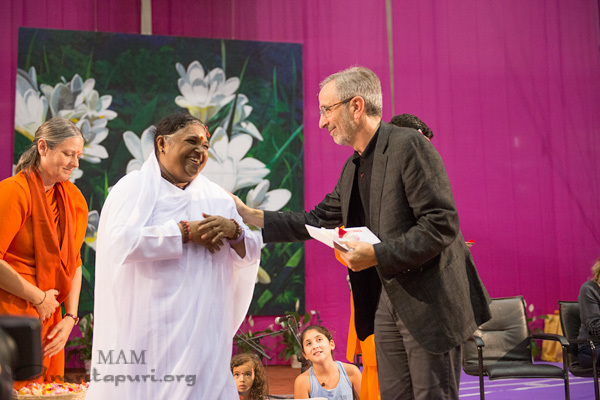 Several other dignitaries from local and state government offices came to officially welcome Amma to the region, over the 3 days. 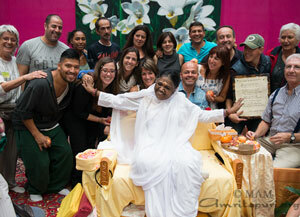 The final evening program of Devi Bhava lasted all night and finally ended at 9am. 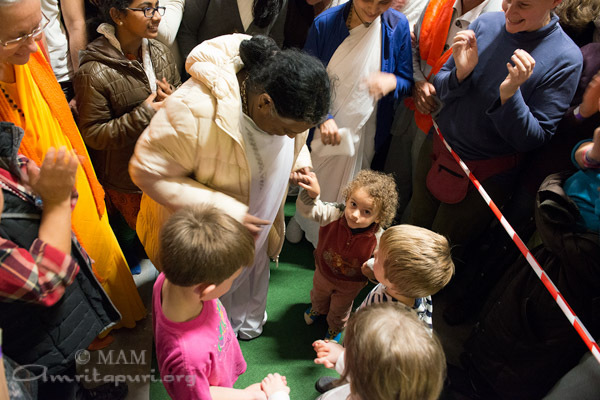 Amma and the tour group then travelled to Munich, Germany for the next stop on the tour.